Appearances can be deceptive and at first glance, the small stone building perched on the edge of a packed car park in the bustling seaside town of Bangor in County Down looks like the least likely place to find the first restaurant in Northern Ireland to be named in The Sunday Times Top 100 Restaurants List for the UK. 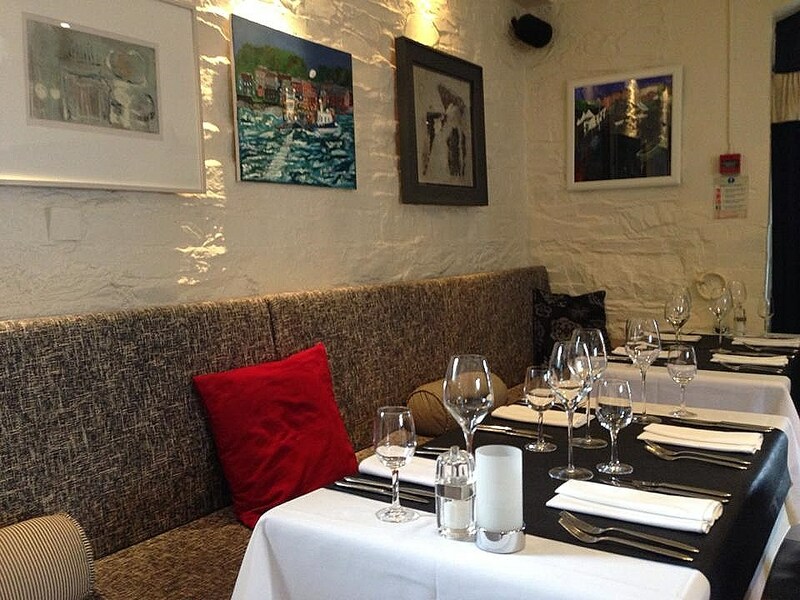 This honour was bestowed on The Boat House last November and came hot on the heels of an award of 3 AA Rosettes – one of only four restaurants in Northern Ireland to achieve this standard. As we approached the building, we quickly realised that we were in the right place and that this diminutive structure, which was originally built in the 1840s, was indeed the home of The Boat House, a restaurant owned by Dutch brothers Joery and Jasper Castel with the former also taking on the role as Head Chef. Once inside we passed through a shoebox sized reception/bar area with the tiny kitchen located to one side before being shown downstairs to our table in the comparatively spacious dining room. Decorated in neutral tones with monochromatic table settings, the room retains many of its original features including the heavy iron rings where the boats were once tethered. The Boat House has an impressive gin list so we decided to forego wine and kick off our lunch by sampling some. 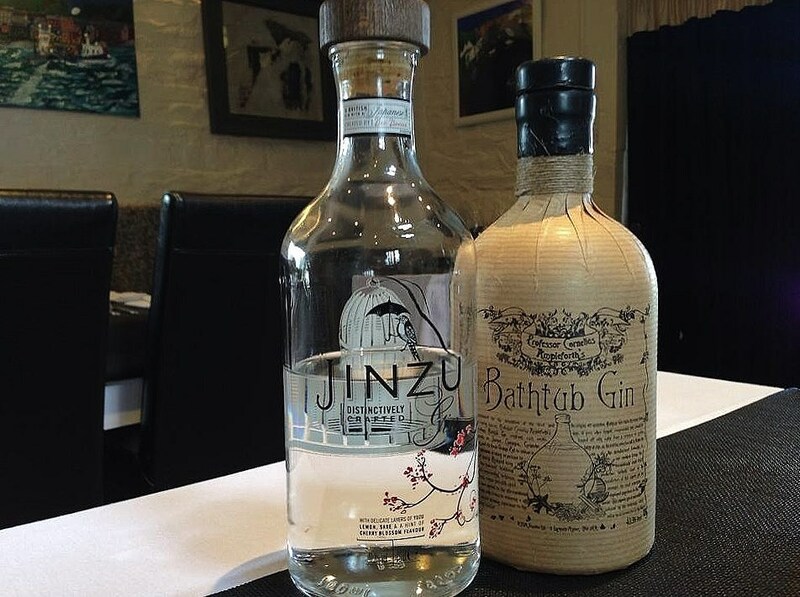 My choice – Jinzu (£7) was an unusual combination of British Gin and Japanese Junmai Sake. I loved the initial burst of fresh juniper which gave way to zesty yuzu citrus flavours and subtle floral hints of cherry blossom. It made a wonderful G&T. By way of contrast, my companion’s Bathtub Gin (£5.50) was infused with a range of botanicals including coriander, cloves, cinnamon and cardamom was full of bold flavours. It made a very different but nonetheless enjoyable G&T. 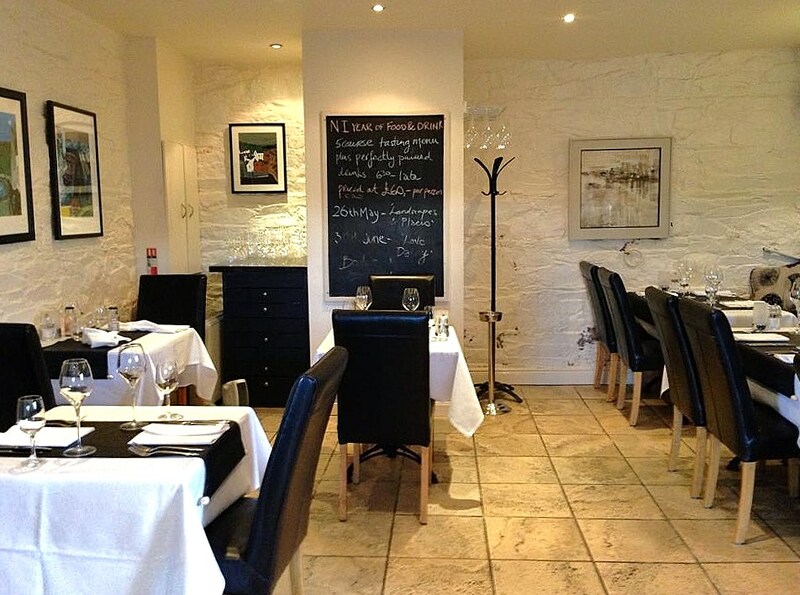 Aside from a standard à la carte menu, The Boat House offers a 5 course lunch tasting menu (£40) which we decided to go for. The dishes weren’t listed but we were feeling in adventurous form and more than happy to go with the flow and see what delights Joery Castel had in store for us. 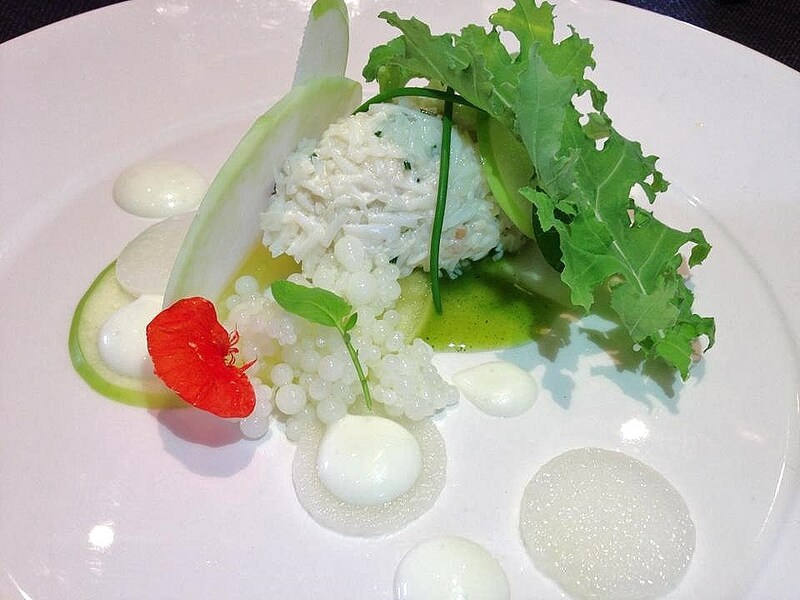 After grazing on brioche-like home baked bread rolls served with butter that was drenched in virgin olive oil, we tucked into our first course of Copeland Island Crab, Kohlrabi, Apple, Nasturtium, Russian Kale, Chives and Buttermilk Pearls. This was a beautifully presented dish which possessed a lightness that made it an ideal opener to a 5 course meal. Everything on the plate served a purpose and worked to accentuate the wonderful quality and sweet flavour of the crab meat. Crisp apple appeared in thin slices alongside compressed discs of slightly peppery kohlrabi whilst everything was brought together in a cohesive fashion by the buttermilk which appeared in the form of a dressing and as ‘pearls’. 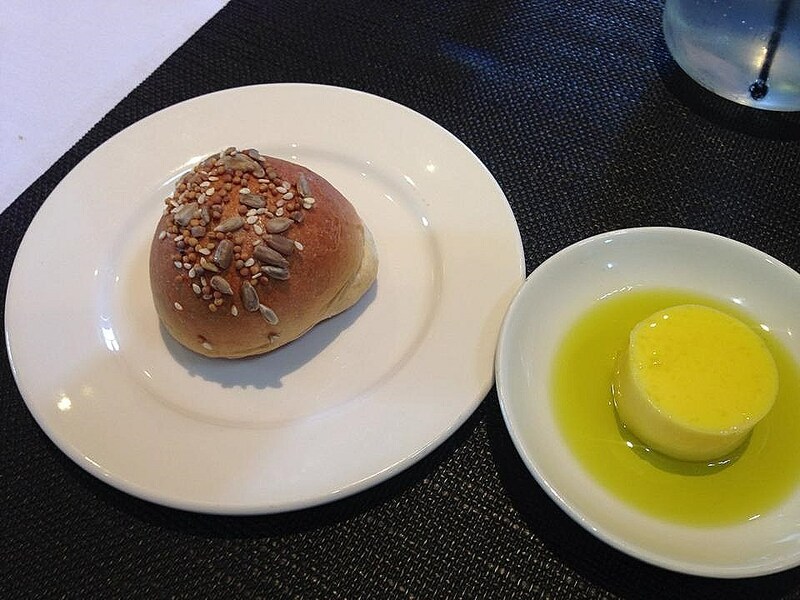 This was a dish which had been executed with sensitivity and an appreciation of the ingredients used. Known as spargel in Germany where it is hugely popular, white asparagus is not something that you often see on Irish menus as we tend to favour the green un-blanched version. Here it was used to make a delicately flavoured White Asparagus Soup where the slightly herbaceous and gentle nutty flavour of the asparagus still managed to come through. I liked the simple, no frills presentation and smiled at the almost menacing looking shark fin shaped piece of charred asparagus emerging from the centre of the soup. 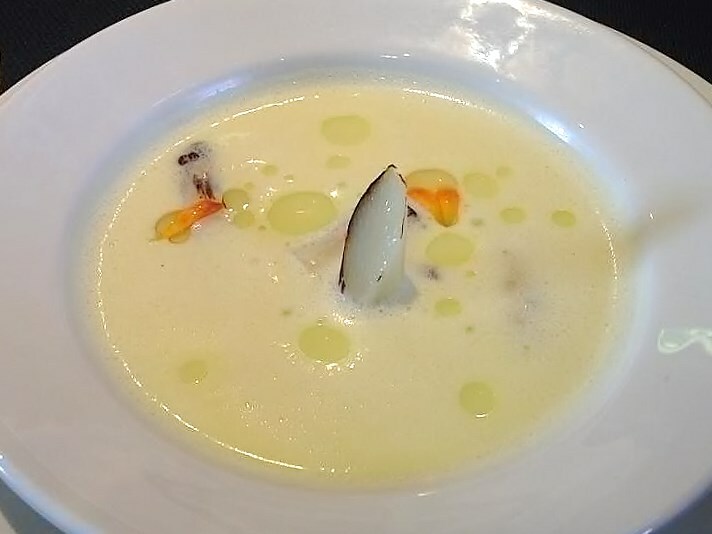 The soup had a loose consistency but retained enough creaminess to make it feel indulgent. 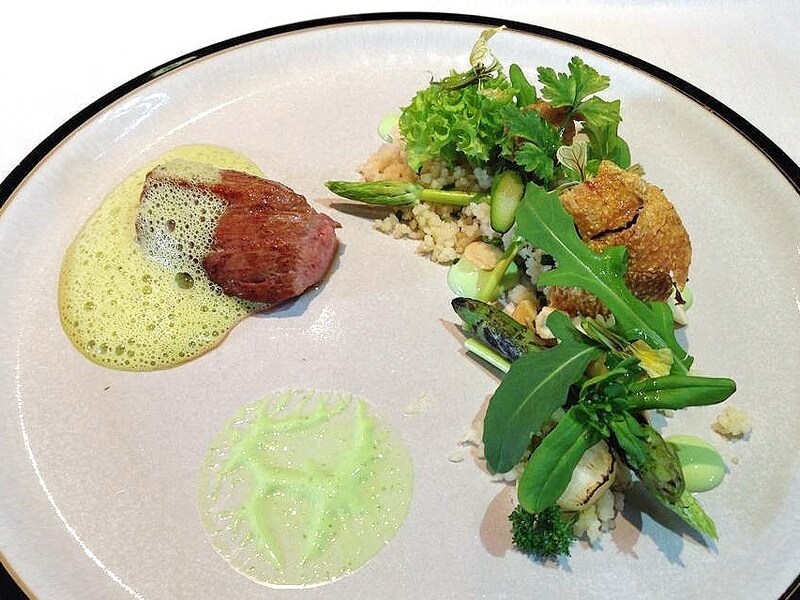 Next up was Loin of Irish Lamb, Black Garlic Espuma, Almond Couscous & Asparagus. I am not normally a huge fan of couscous. I don’t dislike it but most versions I have tried have tended towards the bland and have been unexciting or else loaded with too many other ingredients that overwhelm the palate. In Joery Castel’s hands this was not the case. With a restrained touch, he managed to create one of the best couscous dishes that I have eaten. Well seasoned and herby, with textural contrast provided by toasted flaked almonds, it was topped with a nice selection of salad leaves and a shard of crispy chicken skin. It was the ideal accompaniment to the succulent lamb. I also loved the umami rich flavour of the very on trend black garlic presented as an espuma which floated cloud like on top of the lamb. This was a measured and well thought out dish. Duck with Beetroot, Plum & Smoked Potato Mousseline was another corker of a dish which made sense on the plate. The duck had been cooked sous-vide in a water bath before being finished off in the pan and was as tender as you can get. 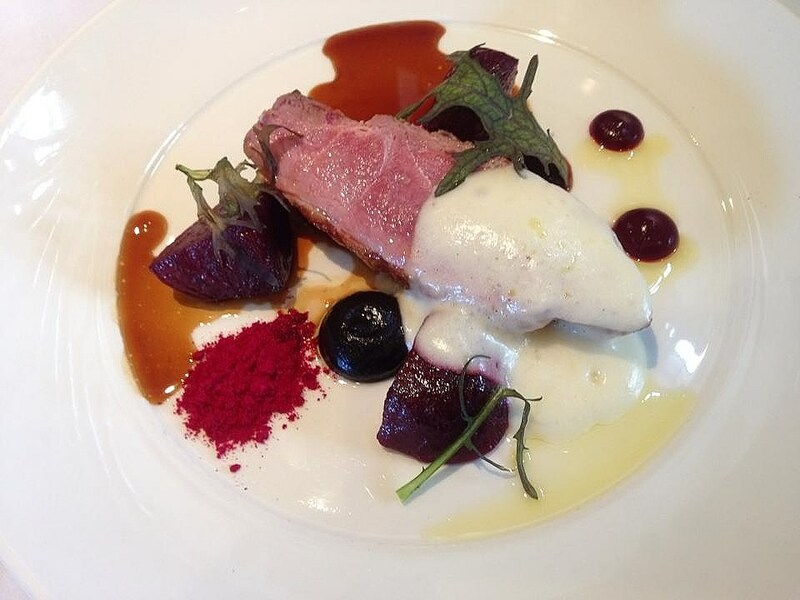 Beetroot is a classic pairing with duck but it is a combination that can feel a little tired. Here it appeared in three guises – roasted, as a powder and as a gel. The dish was completed by an almost sticky plum purée and a deeply flavoured jus. It was outstanding. 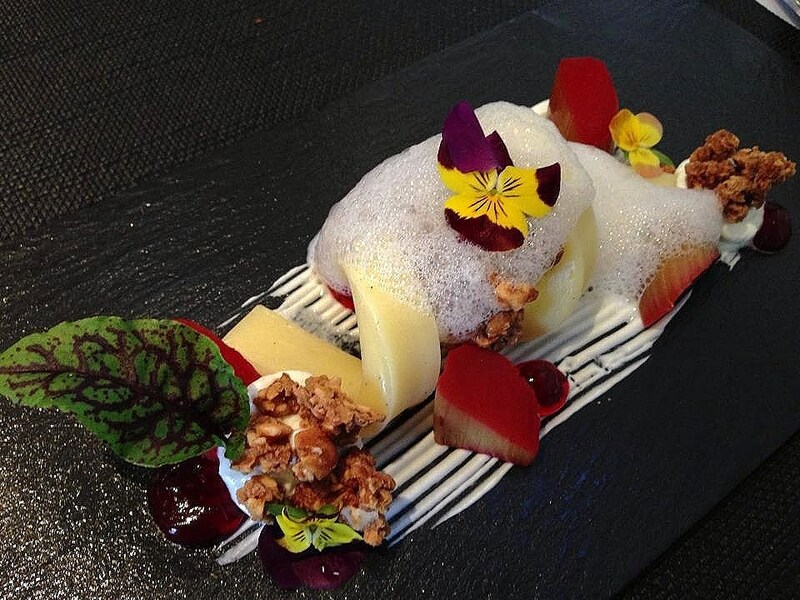 Our meal finished with a sumptuous dessert of White Chocolate Ganache, Poached Rhubarb, Grenadine & Rhubarb Gel, Lavendar Foam, Granola where all the elements spilled out onto the slate on which it was presented in a seemingly random fashion. 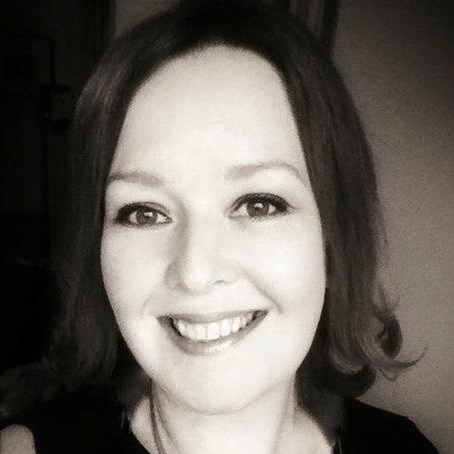 In reality, of course, they had been placed with precision and a sense of purpose. Rhubarb, with its inherent sourness, works well against the sweetness of white chocolate and I savoured every mouthful of this delicious dessert. In many ways the food in The Boat House appears simple but this belies the technique involved in creating each dish. It is obvious that a lot of thought and planning has gone into the food and whilst each dish is considered, it never feels bound by the shackles of fine dining. Flavours and textures dance together in perfect harmony and along with service delivered in an unpretentious and friendly manner, they serve to create a memorable dining experience.